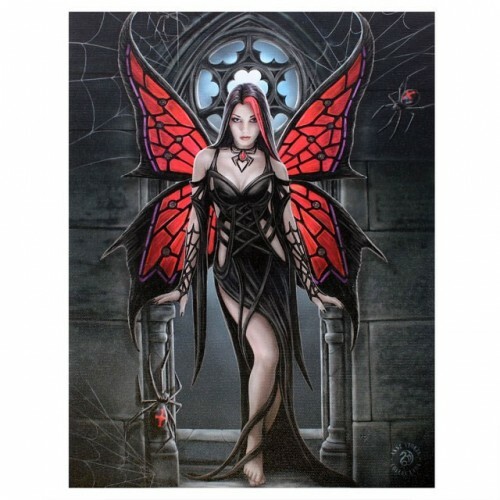 Standing in a long black dress, this dark Fairy stands barefoot on the floor of a church between two grey stone posts, the Gothic arch of a church window rising behind her. She looks at you suggestively, her long black hair having a single red streak in. 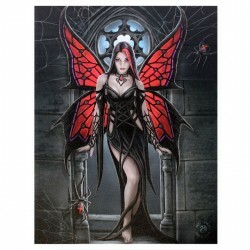 Her black and red wings are stretched out behind her and have a spider web pattern, matching the black and red spider pendant she wears. A black spider crawls up one of the posts.